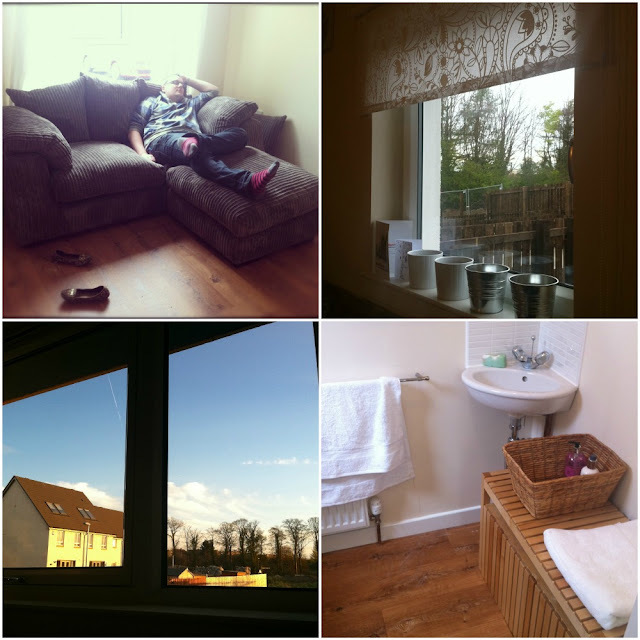 Ever So Juliet | Edinburgh lifestyle blog: Home owners! Life has been a bit crazy over the last few weeks, and that's mostly down to this extravagant purchase. We were due to get the keys mid-April, but thanks to our builders being super speedy, we actually got in three weeks early! This was exciting and wonderful, but also SUPER stressful as it meant that we had a chance to beat the return of stamp duty... which then meant a week of last-minute solicitor meetings, frantic signing of important things, and lots of nervous waiting! So we are in - not quite living there yet, but almost. It means Craig & I have been able to work on our DIY skills... which were initially totally non-existent, but have come on leaps and bounds. New sofa (love love love) | I have a kitchen window! | View | Downstairs bathroom - the first room that looks room-like! Brand new houses are quite surreal - at first it was just a big empty box, and it was hard to imagine how the rooms were going to feel like when we lived there. But bit by bit we're started moving furniture in and it's starting to feel more like our house. I feel like my life revolves around diy, Ikea, Homebase and cardboard boxes, but there is an end in sight! This time next week I should be actually LIVING there... and hopefully there will be no more shelves to put up. Phew. How exciting getting a house! I dream of a bigger apartment, a house seems way off for us currently. Congrats! I day dream about owning my own home daily, one day it will happen I am sure. Yours looks great though, love the sofa! just found your blog and seen this post below a more recent one- congratulations! (though it's late) :) i love reading home posts- like your pretty garden ones!